Trident has become a contentious issue ahead of the general election in May, with Defense Secretary Michael Fallon pledging last week that a Conservative-led government would replace the Vanguard-class nuclear submarines with four new nuclear missile carriers. Fallon’s election promise followed a statement by Scottish National Party (SNP) leader Nicola Sturgeon, in which she said Trident was a “red line” issue the SNP would not support. In the event of a hung Parliament, Labour may seek to form a minority government in an informal coalition with SNP. Critics, including Fallon of the Conservative Party, argue that Labour would abandon the UK’s nuclear weapons program to secure power. Shadow Defense Secretary Vernon Coaker rejected the idea, insisting last week Labour was committed to renewing Britain’s nuclear weapons program, which is set to cost taxpayers £100 billion over the course of its deployment. Monday’s blockade of Faslane naval base follows anti-Trident demonstrations in Glasgow and London over the weekend. 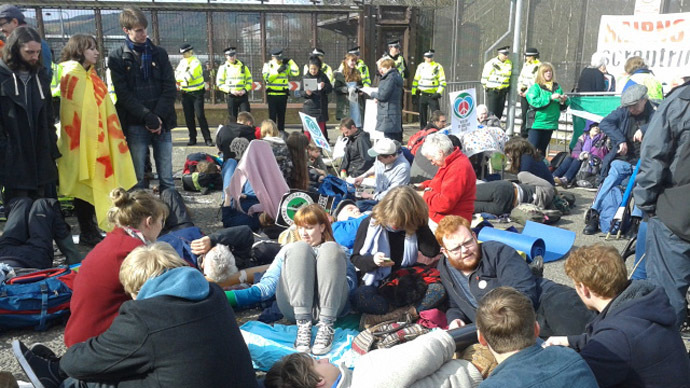 Police Scotland said 34 anti-nuclear activists were arrested in the blockade. O’Hare, of The Common Space, reports that police have attempted to move anti-nuclear activists camped outside the naval facility’s south gate, while the majority of demonstrators are protesting outside the north gate. “We say get rid of nuclear weapons and spend the money on decent things like housing, jobs and education." Patrick Harvie, co-convenor of the Scottish Green Party, was among the demonstrators at Faslane on Monday.